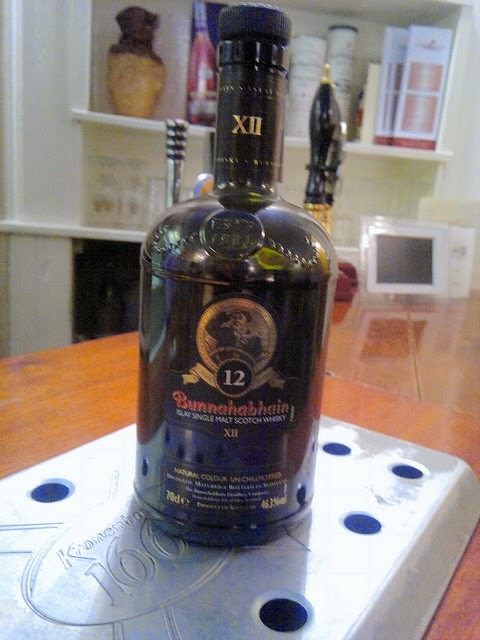 Following on from my Lagavulin piece last week and with a view to expand my Islay horizons beyond the full on peat onslaughts of the glorious Laphroaig and Ardbeg I have opened up a Christmas gift from a dear friend; the Bunnahabhain 12yr. I notice that this has also just gone on sale this morning at Waitrose for £28.50, almost a fiver off (which is damn fortuitous for me having already written this for release today)! Bunnahabhain is the most northern distillery on Islay and is located in a large secluded bay, the location of which the distillery derives it's name which is gaelic for 'mouth of the river'. It is a distillery that has experienced lots of ups and downs having closed and re-opened several times since it's founding in 1881. Now the distillery produces over 2.5 million litres a year, with the vast majority going to blends, but they do release a good deal of single malt and also sell casks onto independent bottlers. Nowadays Bunnahabhain try and release more high quality, craft style malts that are bottled at higher strengths, having undergone no chill-filtration, which can only be seen as a good thing in my eyes. On the nose there is a peppy spice note to start off with citrus fruits, salt and the sea; all of this is then followed up by raisins, nuts, cream, syrup, vanilla and a lightly sherried dried fruit quality. The Bunna (to his friends) is a very soft and rounded but very fresh dram, it isn't aggressive on the peat at all, it's very restrained and refined, but balances fantastically with the sweeter elements. On the palate, due to being at a higher 46.3% (very precise), it can help to add a touch of water if you'd like, but be sure to try it first before adding the water! This is a fairly sweet Islay malt due to the use of the sherry casks. There is plenty of coriander, cinnamon, maple, nuts, coffee, some chocolate, a slight sherry flor, salt, seaweed and the lightest saline peat coming through to give you just a hint of the ocean. This is a great dram that whilst having decent body still seems quite light and is uplifted by the freshness it has on the palate, there is a lot of depth and having been bottled at a higher strength really seems to add a lot in terms of mouthfeel and also complexity. This malt is very light on the peat in comparison to most Islay drams, and whilst I know that the refinement and poise is something I knocked the Lagavulin for, I feel a bit differently here. This is such a fresh whisky that has the notes in all the right places, conjuring up images of the seaside and the ocean that I love so much, with added depth and complexity that means it really does have something special in my opinion, without the onslaught of smoke. I really did enjoy this whisky and think it would certainly serve as a great stepping stone into the peat monsters alongside Highland Park and Talisker. I can't wait to get my hands on a Bunnahabhain Toiteach, a heavily peated dram, to see how the spirit stands up.